The clavicle (collarbone) connects the shoulder and arm to the rib cage. Fractures of the clavicle are common and account for about 3-4% of all fractures. Many mechanisms of injury can lead to a clavicle fracture including falls on an outstretched hand, falls on the side of the shoulder, or direct impact to the clavicle. About 80% of clavicle fractures will occur in the middle of the bone. Patients will typically have considerable pain associated with clavicle fractures. Movement of the bone ends with crunching or clicking can sometimes be felt when the patient moves their arm around. Bruising will typically occur over the top of the clavicle and upper chest. Unless the clavicle is poking out of the skin (open fracture) it should be initially treated with a sling or shoulder immobilizer. Most patients feel more comfortable sleeping upright in a recliner rather than laying flat in bed. Removing the sling to move the elbow, wrist, and hand is okay in order to prevent stiffness in those joints. Ice over the clavicle can help with both swelling and pain. Most clavicle fractures can be treated without surgery. If your surgeon recommends non surgical treatment, it will include sling or immobilizer use for about 4 weeks followed by a slow progression of range of motion exercises. It takes about 2-3 months for the clavicle to heal. Sometimes formal therapy for strengthening and rehabilitation is necessary. A gradual return to work or athletic activity is allowed once the clavicle heals. Smoking can increase the risk of the clavicle not healing (called a nonunion). The surgeon will follow the progress of healing with xrays and sometimes a CT scan if evidence of healing on the xrays is inconclusive. Most patients who are treated non operatively do very well and can expect a return to all their normal activities with no loss of function. 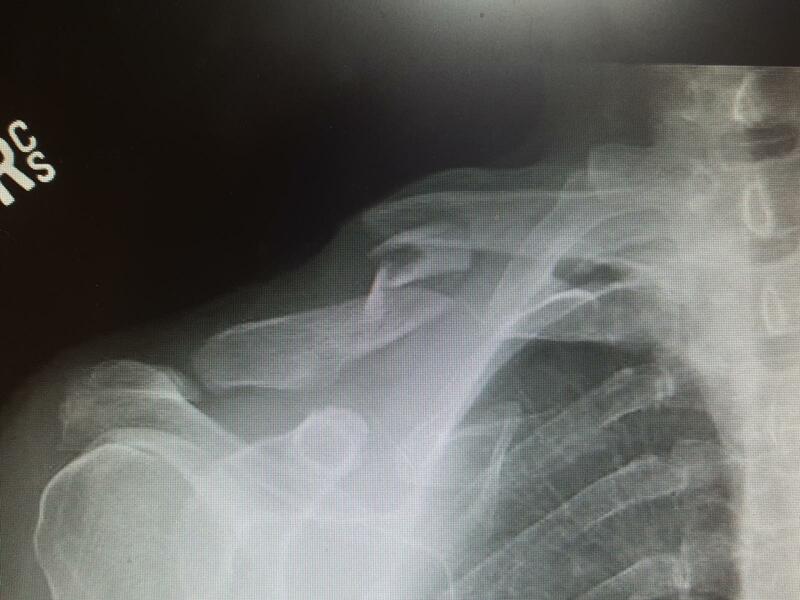 Clavicle fractures can sometimes have considerable displacement (ends not touching) or shortening which will increase the chances that the bone will not heal (non union). It is known that some fractures that don’t heal, or heal in a significantly displaced position, can cause pain or fatigue in the shoulder. Therefore, some clavicle fractures are best treated with surgery to re align the bone and fix it in place with plates and screws. This can be done as an outpatient but does require general anesthesia. 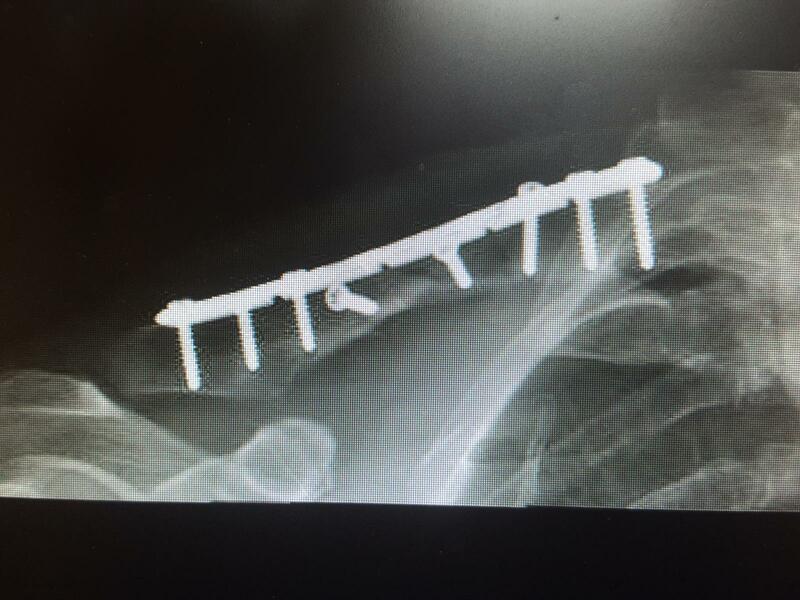 It will still take 8-12 weeks for the bone to heal but usually the stability provided by the plate will allow the patient to start moving their shoulder quicker. Some physical therapy is usually required for full rehabilitation. Light duty work can be done during healing and rehabilitation. If you or someone you know breaks their clavicle, give Dr. Scott Murch a call right away at 715-847-2382 to be seen and evaluated.